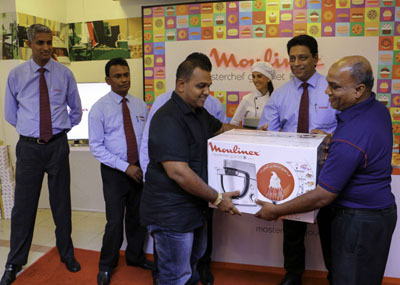 Retailer of household and electrical appliances in the country Singer (Sri Lanka) launched the ‘MasterChef Gourmet Plus Kitchen Machine,’ the latest state-of-the-art version to complement the kitchen machine range under renowned French brand Moulinex. The launch took place amidst a special gathering of home bakers and Singer Management at the Singer Mega Store located at Duplication Road, Colombo 4. The launch coincided with a live demonstration segment conducted by veteran hotelier and Manager – Culinary Education for Singer Sujiva Withana. The MasterChef Gourmet Plus is most suitable for home-based baking and pastry enthusiasts.